From left, Resident Directors Rachel Patton, Katie Ellis and D.J. Heyward plan ahead. Some students like to sleep with a light on or prefer falling asleep with a television on. Others prefer a dark, quiet setting. Similarly, some students don’t mind an overflowing trash can or dirty dishes in the sink, while others cringe at smelly, unsightly messes. 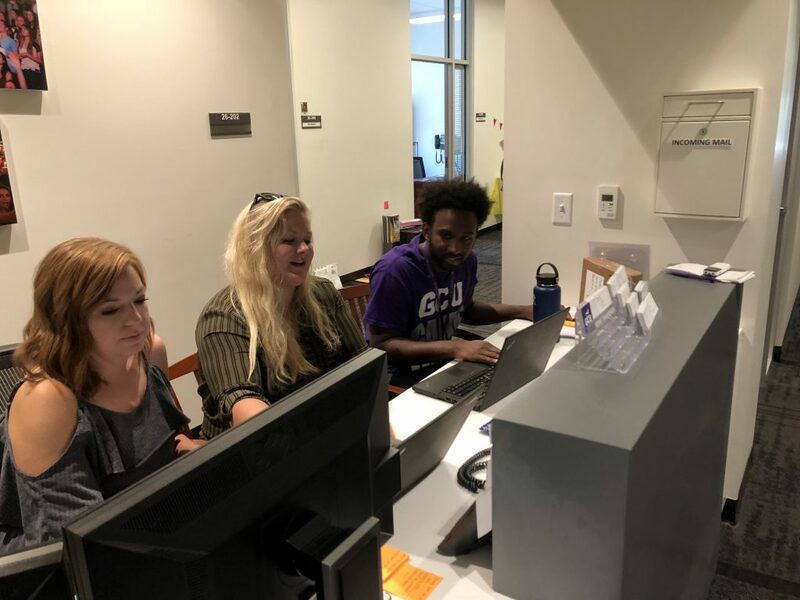 With Move-In beginning Aug. 20, Grand Canyon University Resident Directors D.J. Heyward, Rachel Patton and Katie Ellis shared tips for living harmoniously in the resident halls and apartments and establishing relationships with their RD’s and Resident Assistants (RA’s). “One of the benefits of living on campus is having an RA to support you, so students who really get to know their RA not only have a fun interaction with them, they are in the know with what’s going on in their living area and they attend community gatherings,’’ Heyward said. “It’s especially important for a new student. Studies show that when students get involved in their community, it coincides with their academic success. North Rim Apartments line the left side of Lopes Way with Papago Apartments North in the distance. Prescott Hall and Camelback Hall border the right side. A roommate agreement is a list of considerations roommates make to each other, including what time lights will go out and what time devices are turned off. Understanding each other’s differences is important. Heyward, Patton and Ellis are among 41 RD’s living in the residence areas. 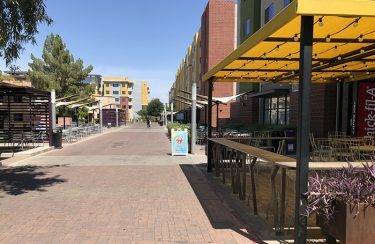 Heyward will oversee 500 residents and 10 RA’s in Papago Apartments, Patton is guiding 300 residents and 10 RA’s in Chaparral Hall and Ellis is responsible for 300 residents and six RA’s in Cactus Apartments. 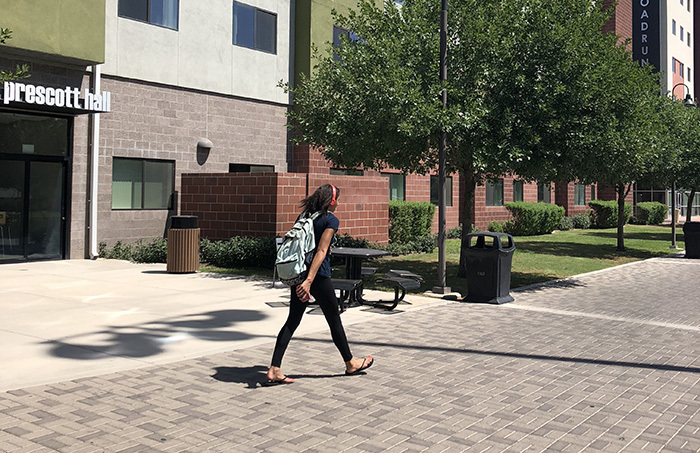 With the opening of Jerome and Cactus, two new apartment buildings on the east side of campus, there will be an unprecedented number of students — an estimated 12,000 — living within GCU’s boundaries. That, in turn, requires the largest team of RD’s and RA’s in GCU history. After preparing all summer, including a three-day retreat July 18-20, the RD’s will spend two weeks in early August training RA’s who arrive on campus early to prepare for their leadership positions in the 21 buildings that house students. As the number of students living on campus continues to grow, the RD’s must adjust to meet the challenge. Among the activities, all of them designed to build community and facilitate friendships, is a stress-relief session in which students make stress balls (balloons with beans inside) and talk about their concerns. S’mores Night and Waffle Night are planned for various floors. Entire communities will gather for all-building Fall Festivals, featuring a live band and painting pumpkins. In the past, one living area used its budget to rent a mechanical bull. The well-appointed lobby areas, with their comfortable couches and chairs, large flat-screen televisions and ping-pong tables, are a prime meeting place. So are the swimming pools adjacent to several of the buildings. 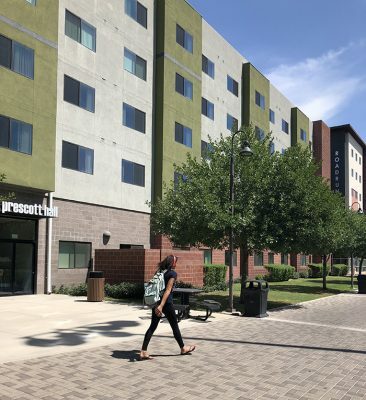 A view of colorful Prescott Hall and Roadrunner Apartments in the heart of campus. Cooking lessons and laundry tips are part of the CLP, which is in its third year under Director of Resident Life Matt Hopkins. “It is anything applicable to new incoming students or returning students who maybe haven’t lived anywhere other than home,’’ Ellis said. In the cyclical nature of living on campus, many of the freshmen who become the most involved apply to become RA’s for their sophomore years. Interestingly, Heyward, Patton and Ellis were not RA’s in college, yet they all share a similar background in terms of working with young people in faith-focused environments. Patton earned a bachelor’s degree in Special Education from Arizona State and a master’s degree in Christian Studies from Southeastern Baptist Theological Seminary in Wake Forest, N.C., and then worked with high school students at summer camps and in campus ministry. Patton’s ministry training is implemented as she begins her second year as an RD. RDs often share their faith with students. 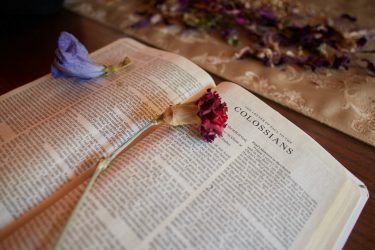 Ellis earned her bachelor’s degree in Biblical Theology and Photography from Sacramento State, whereupon she returned to her San Francisco Bay Area family home to work in youth ministry. Heyward grew up in New Castle, Del., and earned a bachelor’s degree at ASU in Nonprofit Leadership and Management and a master’s degree in Leadership from GCU while working in a teen program at the Boys and Girls Club. “I love being able to walk with students through the hard stuff and then celebrate with them when they have successes,’’ said Heyward, a fourth-year RD. He rejects the perception among some residents that RA’s and RD’s are in “gotcha’’ mode. “One thing that is important with our roles as RA’s and RD’s that some students don’t know is that we are not out to get them,’’ he said. “I think there is a bit of a stigma that RA’s are like the police. No one signed up for this job to be that. We all signed up to build community to support the students. Our RA’s are incredibly passionate about meeting the residents where they are and being able to support them and love them the best way that they can.